Josh Swinnerton couldn't bear watching his mum continually struggle to manage a dozen medications she was taking for Parkinson’s Disease and rheumatoid arthritis, so he decided to do something about it. “My mum takes a horrible range of 11 or 12 long-term prescription medications -- and just seeing her struggling with remembering to take this at this time, and another at that time made me think that surely organising, managing and ordering your prescription medication should be a no-brainer to have on your smartphone,” Swinnerton told The Huffington Post Australia. 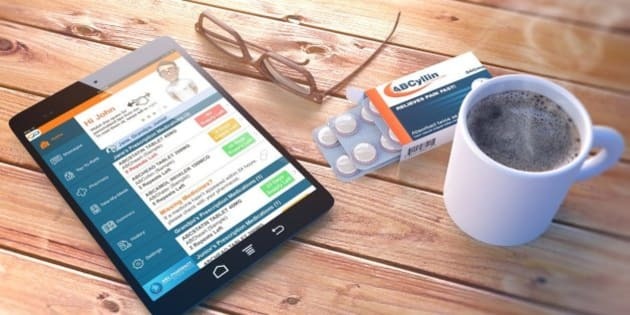 He said once a patient signs up to MedAdvisor at the participating pharmacy of their choice, the app keeps track of every time medicines are dispensed, and lets patients know when to take it, how long their supply will last, when it’s time to collect a refill and when they should visit the doctor for repeat scripts. A feature added this week allows the app to link with general practitioners, enabling them to track patient adherence to their medication programs. It also allows for prescriptions to be re-issued remotely if the patient doesn't require an examination. Swinnerton said the app was free for customers, and simple to use, with patients guided by an animated character called Pharmacist Phil. “We have 120,000 active users over two years, and we have pretty close to 25 percent of Australian pharmacies connected,” Swinnerton said. He said another reason he decided to develop the app was due to the alarming rates of medication non-adherence, with global figures showing that 50 percent of patients don’t take their medication exactly as prescribed by their health care professional. Australian figures are consistent with these, estimating that 41 percent of Australians have stopped taking prescribed medicine before they were meant to, on at least one occasion. “Economically it’s considered that medication non-adherence is one of the top two or three most solvable problems of the health system,” he said. “With the elderly, the correlation between the time they stop taking their own medication and the time they end up in a nursing home is very strong. Software developer Josh Swinnerton developed MedAdvisor to help people like his mum. One of MedAdvisor’s many users is Melbourne woman Brooke Parsons, who takes multiple medications. When she was just 13, Parsons had a stroke and has since been diagnosed with multiple conditions, including polycystic ovarian syndrome, mitral heart valve prolapse and lymphedema of the right leg. She’s had 44 operations in 23 years, and takes 15 medications, some up to three times a day. “I use the MedAdvisor app now,” she said. “I keep pretty good track of my medications, but I like it when it tells me when I’m running low. “I also use it for my vitamins so it keeps track of them as well. It lets me know when I’m due to take them -- it gives me a little alarm bell at 7am, 12.30pm and 8.30pm and tells me what to take. Parsons said she also liked that the app had a ‘carer mode’ that allowed a family member to manage the medications of a child or an elderly parent. “If it helps me, it’s going to help thousands of people,” she said. Pharmacist Phil helps patients keep track of their medications. Swinnerton said he developed MedAdvisor with the same core team he worked with in a previous company called Desk Active. “It was more for sedentary office workers to remind you to take desk breaks and tracking how long you spend at your computer without a break,” he said. “Connections I made while working on that over in the U.S. said ‘love what you’re doing with animated characters as coaches and stuff, but one of the biggest problems in the entire health systems is people not using medications properly’. And they’re right. “Medication is something that people are dealing with, managing and coping with many times a day every day. Swinnerton said the challenges with developing an app such as MedAdvisor centered around relationships with pharmacies. “The politics and relationships needed to connect to the software in the pharmacy is a tricky one -- there are up to 10 different manufacturers for pharmacy software in Australia, and ideally, you want to be able to able to connect to all of them,” he said. “Privacy and security of data is obviously also a big concern for customers; ensuring we're only ever transferring sensitive data for patients that have consented and we’re doing that in a secure way. There's so many variations of medicines that work in different ways too. MedAdvisor is available free on a variety of devices. Swinnerton said to raise the funds they needed to get MedAdvisor into more pharmacies and to develop it further, meant they had to engineer a reverse takeover in order to be listed on the ASX. “For very early stage companies, it seems to be they often do RTOs. We had some good connections to the people at (Exalt Resources) -- (it) was a dormant early-stage mining company, that was already listed but not doing anything," he said. "They helped us manage the reverse takeover really well -- we were trying to raise $5m as part of the listing and we were oversubscribed to over $7.5 and we scaled some people back, but was a good sign of enthusiasm, and we’ve traded reasonably well since then.